Peddlin' through the neighborhoods that raised us! Beautiful Jersey City, New Jersey. Ello! We are Trisha and Lloyd and we are #Baonanas.. for you! Along with our Shiba Pup Iroh, spontaneity and adventure has followed us everywhere since we met in 2010. Other than hiking, traveling (when we can afford it! ), Brazilian Jiu Jitsu, dancing, show-binging, biking, scuba diving, reading, taming dragons, and water-bending (okay maybe the last few were made up), EATING has always been a passion of ours. Especially when it comes to dessert. We feel your pain when you scroll through Yelp, like someone repeatedly opening a fridge, hoping to find something new and exciting. We 're ecstatic to offer a game-changer in modern desserts and it's all thanks to the support of our #BaonanaNation! You transformed our hashtag and small Instagram fundraiser into the newest dessert craze to hit the New Jersey / New York City area. Since 2014, juggling our education has been a challenge, with Trisha pursuing Law School and Lloyd pursuing Occupational Therapy, but you make every second of this grind worth it.. Thanks for being baonanas for us, we're always #Baonanas for you! How we got started is kinda crazy! It all started with this post. Our story involves a yellow car, a broke college couple, and the generosity of family, friends, and friends-to-be. We were just two kids from Jersey City with a homemade banana pudding that was a constant hit at our get-togethers for family and friends. In March 2014, our yellow car fell victim to a fender bender while parked in front of our house. Life went on, classes continued, we could live with this booboo! One month later we decided, on a whim, to make a batch of our infamous banana pudding to indulge and give some out to friends. We barely had time to hangout due to our classes, and desperately needed an excuse to see our homies! During one of these catch-ups, a close friend insisted on paying for his share to help us start a "Repair Fund" for our car. 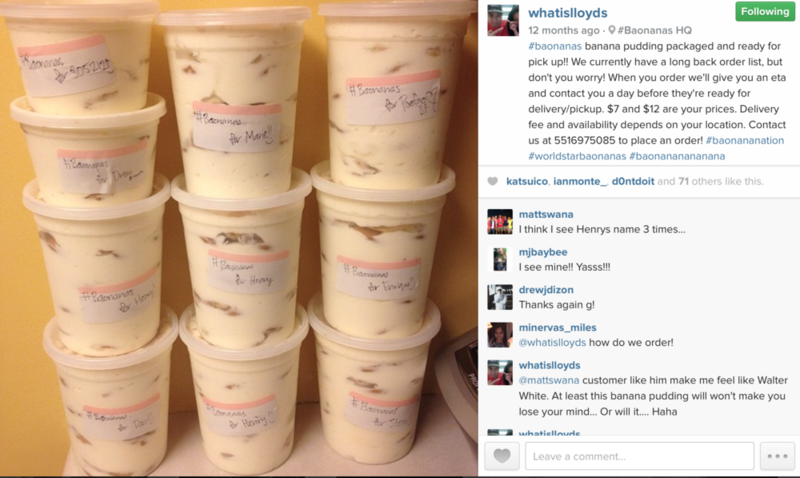 Thus, the idea and hashtag, “#Baonanas,” was created to easily spread the word of our banana pudding. Surprisingly, our popularity on Instagram skyrocketed and we had orders left and right from family, friends, and strangers alike. We raised enough money in two months and were encouraged by our #BaonanaNation to keep this thing going! Since then, our mission is to keep spreading the love we received by developing innovative flavors, using quality ingredients, providing unforgettable catering experiences, and supporting local businesses. So in the words of @whatislloyds from 2014..
"What started as a spontaneous little fundraiser to repair my car has transformed into a humble business for Trisha and me. #Baonanas has also given us the opportunity to catch up with many friends who have supported and continue to support us, and for that, we will be forever grateful. For those friends, we have learned what “made with love” truly means.. So to you, we say thank you." Before our trays, we used buckets! Our third and last hand-written labels! Typical weekend for #Baonanas back in the day! Easter egg left out of our story! Shorly after getting repaired, Lloyd was in a freak three-car accident, but came out unscathed. Ella, however, got a familiar looking boo-boo.